Ours is not a fish tale, but a tale of fish 60 years in the making……of a family-owned seafood market that spawned a restaurant company with over 30 locations along the Eastern Seaboard, and a Gourmet Mail Order Catalog Division that ships Coast to Coast. We invite you to experience the freshest and highest quality fish available. Remember, Fish is brain food. So be smart, and eat more! 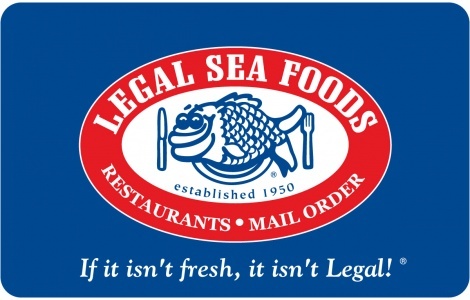 You may redeem this Legal Sea Foods Gift Card for food and beverages only at the time of payment at any Legal Sea Foods location or online at shop.legalseafoods.com. This Gift Card is not transferrable without the permission of Legal Sea Foods. This Gift Card will not be replaced if it is lost, stolen, destroyed, altered, or used without your permission. This Gift Card cannot be returned and is non-refundable. Except where required by law, this Legal Sea Foods Gift Card will not be exchanged for cash. Use of this Gift Card constitutes acceptance of these terms and conditions. This Gift Card has no expiration date or other service fees.